In 2005, I felt God challenging me to come to terms with the fact that I claimed to be a Christian but I was living indifferently, without demonstrating any faith and without any action that might remotely resemble someone who loved, trusted, or followed Jesus. I was lukewarm on God. The way C.S. Lewis boiled it down was the turning point. Those words spoke to me saying: decide for yourself, man up. It was time to get rid of my bad assumptions as to what Christians believed or how they behaved. It was time to act: read, seek, pray, get real and come to a final answer for these two very important questions. Was Jesus who he said he was? And if so, what did he say? I had previously dabbled in Bible reading but it was mostly half-hearted. This time I approached the Bible with reverence because I was actually afraid of coming to the conclusion that Jesus was perhaps a madman, and then I’d be left lost and empty. Then I read the book of Matthew and it spoke to me like it had never done before. People were going crazy for Jesus and his fame was spreading like wildfire but, in his hometown of Nazareth he was rejected. They had heard about his miracles but they didn’t believe, and this disbelief was why he didn’t perform any miracles in Nazareth. Isn’t this how we treat Jesus sometimes? Show me a sign, then I’ll believe. Matthew 11 tells us that after a long day of teaching, Jesus’ disciples hop into a boat and after dismissing the massive crowd (of 5,000 who Jesus just miraculously fed), Jesus went up the mountain to pray. I’m thinking Jesus had a good heart-to-heart with his Heavenly Father and spent some time mourning the loss of John the Baptist. This John, whom Jesus referred to in Matthew 11:11 as “among those born of women there has arisen no one greater”. John was a relative of Jesus, he prepared the way for Jesus, he baptized Jesus. John served him through imprisonment and a brutal death so Jesus must have been in deep sorrow. When Jesus returns from praying, he finds that the boat had drifted and he performs another miracle: He walks on water to meet his disciples. They see someone coming; they were frightened and thought he was a ghost. Jesus tries to calm them but Peter wants proof of who he is. 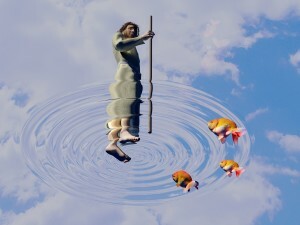 Peter shows some faith by telling Jesus to “command him” to walk on water. Peter then miraculously walks on water, but even with this he starts to doubt and he begins to sink. Again, like us, we want a sign, we get a sign, but we end up doubting and sinking. Before closing, I want to take the time to say happy birthday to Rick Jebb. Rick is one of our authors, a close friend, a mentor, a leader, a brother who cannot stop talking about Jesus (seriously, I don’t think it is in his power to stop). Rick is the person who was integral in my own in-depth study of the Sermon on the Mount – which I am eternally grateful for. Rick, you’re a difference maker and a wonderful human being, I thank God for all that He has shaped you to become! Do I believe that Jesus is the son of God? Do I live like I believe Jesus is the son of God? Would my friends, family, and co-workers agree with my answer to question two? What actions should I take to reconcile any differences?